And it’s done. The big move is over! The 140 boxes were moved within 3 hours, the boxes unpacked within 48 hours, and every little bit and bob tucked away neatly. This was the craziest house move ever, with the decision made in a week or so and the move executed within 3 months of deciding to let our place go. So after breaking a nail, having a pole drop on my head and getting awful tendinitis from the unpacking, I’m really pleased that everything is pretty much done. For the past month or so I’d been struggling with higher insulin requirements and hey…the day after I moved things just settled down. Which just shows you that moving house causes real physiological stress. I read that in the U.K., a survey showed that most people find a house move even more stressful than divorce. Which is crazy. But it was weird to see my hypocounts just land happily the day after moving. Anyway, part of the stress of the move was moving from an apartment with both a dry and wet kitchen to an apartment with a very modest sized kitchen. So I literally moved from 2 kitchens, 2 ovens, 2 stove tops and a ton of storage space to half of what I’d been used to. This exercise really helped me to declutter. Goodness knows what will happen though, when we start cooking for big groups again – my helper and I will probably be falling over each other. It will take a little more careful menu planning to make sure that we don’t end up killing each other in the process. About 2 days before moving I had packed up the kitchen, which meant that for about 3 days or so, we were eating take out. Surprisingly it was kid#1 who grumbled about not having home cooked food. I guess we are a family that eats in a lot, contrary to a good number of Singaporean families that usually eat at the very convenient and relatively cheap hawker centers and food courts. We do eat out about once a week but otherwise we are pretty home-bound. So even though hubs bought really nice takeout for the past few days, it was a great relief to be able to get my Instant Pot to work again. To be honest, I was still kind of tired out and I wasn’t in the mood to make a complicated meal. It was good to dump the frozen chicken into the pot and get a hearty chicken zoodle soup for us. The zoodles, or zucchini noodles, were a nice noodle substitute and made the soup light and refreshing. The meal was cooked in between having the IT guy set up my wifi and the electrician redo the wiring for my microwave/convection oven. Super easy and effort free. My electrician couldn’t get over the fact that I had a multifunction oven that could do microwave, grill and convection/fan bake. I pointed out that I had the Instant Pot with 7 functions of sautéing, pressure cooking, steaming, yoghurt making, rice or porridge making, slow cooking and warming. I realized how technology has made the kitchen more streamlined, which is good since I now have to work out of a tiny kitchen. 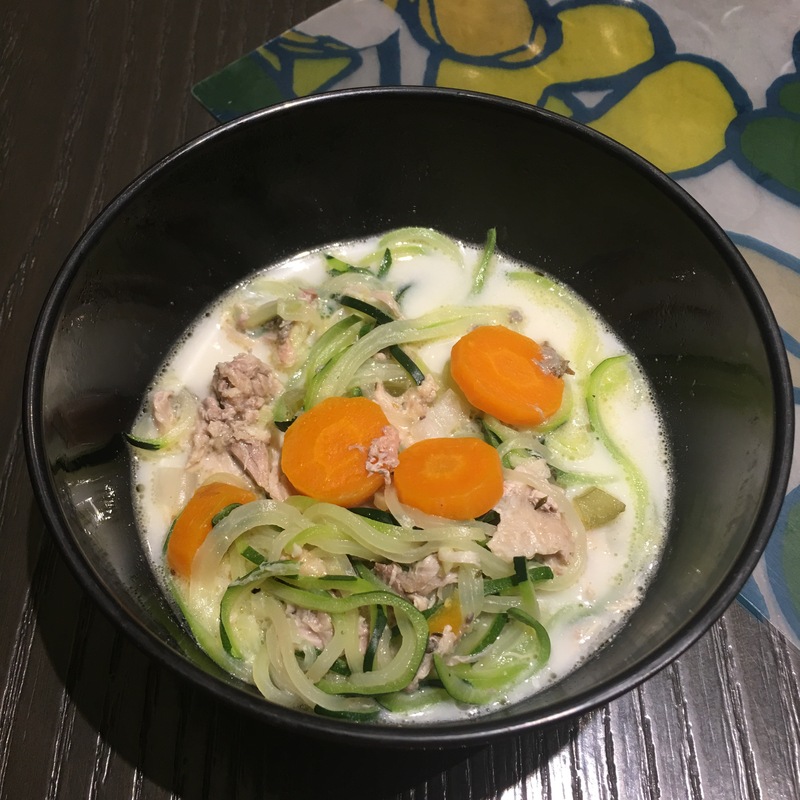 So here’s the recipe for Instant Pot chicken zoodle soup – 30 minutes from start to finish; from freezer to table. 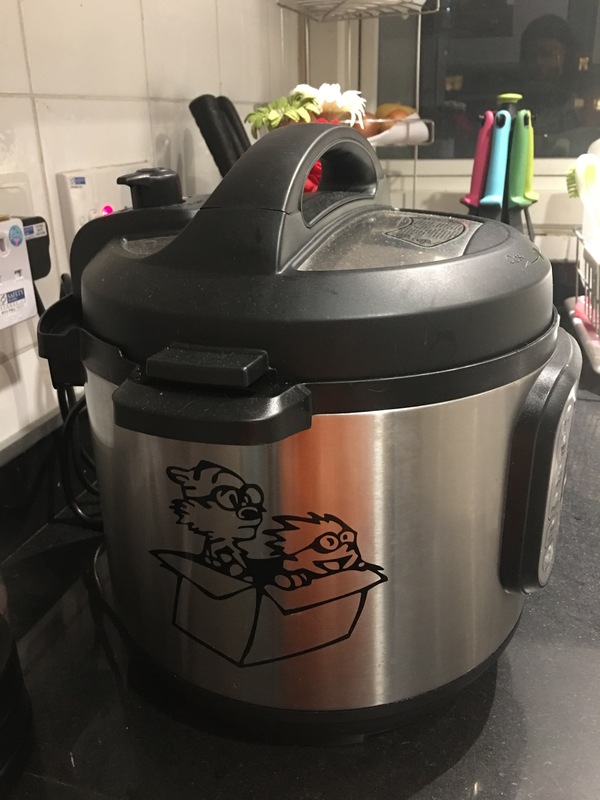 My Instant Pot in its new and smaller home. Place the chicken, chopped carrots, celery, onions, water, salt, pepper, dried rosemary, thyme, bay leaf and paprika into the Instant Pot. Seal and pressure cook on high for 15 minutes. In the meantime, spiralize the zucchini to make noodle shapes. Set aside. When the pressure cooking is done, allow normal pressure release about 10 minutes. Open the pot and remove the chicken. Add the zucchini in and put on sauté mode. Add the cream in and adjust seasonings. Debone and shred the chicken and put the meat back into the pot. The zucchini should be cooked and just softened for about 3-4 minutes. Serve piping hot in bowls.